Chicago mayoral candidates Rahm Emanuel and Jesus "Chuy" Garcia spent the day Saturday criss-crossing the city with less than three weeks to go until the runoff. While freezing cold temperatures were blamed for the low turnout at the polls in the Feb. 24 election, the April 7 runoff election hits right in the middle of Spring Break for Chicago Public Schools. In the final dash before the race, both candidates are campaigning like every day is Election Day. "As we approach April 7, we'll have thousands and thousands of volunteers knocking on doors and getting the vote out," Garcia said. Garcia is counting on his grassroots effort and boots on the ground promised by his organized endorsements, he said. The mayoral candidate received another endorsement Saturday from the progressive nonprofit Action Now. Garcia also stopped by the Rainbow PUSH headquarters in the morning for a weekly forum in an attempt to court the crucial African-American vote. Mayor Emanuel spent the day in two wards -- the 29th and 37th -- on the Northwest Side of the city, where the incumbent aldermen are also facing a runoff. 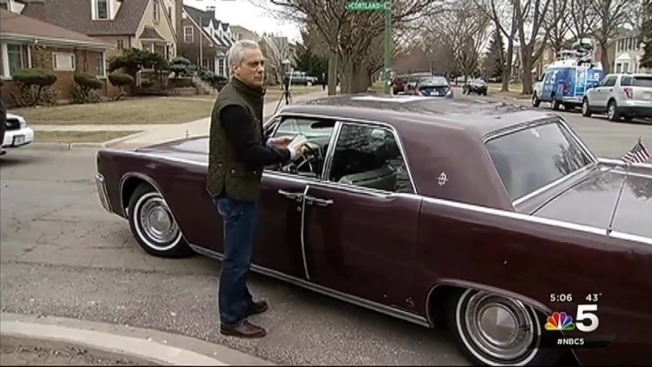 For the fifth straight Saturday, Emanuel went door-to-door telling supporters why he deserves another term. "One of us is going to be mayor for the next four years," Emanuel said. "One of us has the plans, perseverance, the policies to see that through and get the job done." Recent polls show Emanuel's lead over Garcia growing, but both candidates know the key to City Hall depends on who turns up at the polls. A near record low of about 33 percent of registered voters cast ballots in February. With both CPS and several Catholic schools on Spring Break the week of April 7, Emanuel and Garcia are urging supporters to vote early starting Monday. "There's no waiting, there's no fussing. Come out and take care of it," Garcia said. There are 51 locations for early voting throughout the city. Find the complete list here.